We are on a roll!!! G’day, eh? We have a guest in the studio again! Throw on the back bacon — it’s Katie Bryski! Things you shouldn’t do after the Smoky Writers: Have your liver tested. Since the Smoky Writers events, what have Tee & Pip been up to? The Silver Pharaoh is submitted to Laurie. Wolf in the Fold is also submitted to Laurie. Audio recording for Ministry Protocol is underway. Tee’s still job hunting, still working on Wolf in the Fold, and also working on something for Valentine’s Day. What Katie has been up to since Stonecoast? She’s our intern for February! Katie is still working on a book that is formally known as formerly known as Styx. In Season Three of Tales from the Archives, things get very Canadian! The first challenge of Stonecoast: Get to the right Portland! 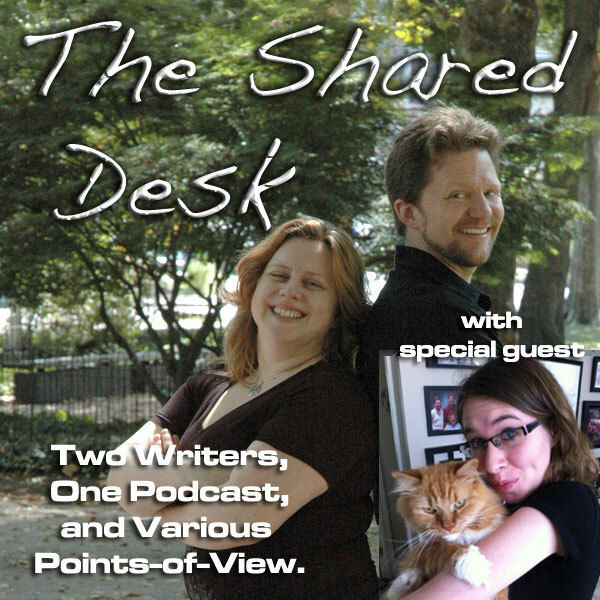 Tee’s mic problems and Pip’s odd need for editing…eh, just go with it! This isn’t NaNoWriMo or a writers’ retreat, folks. This is graduate school. For writers. And there is Tee, just being far too ‘Murican. Pip asks who would Tee want to have as his Writing Mentor…and Pip makes an uber-#SteampunkFAIL. But Katie is a published author already…so why does Katie need a Masters Degree in Writing? Katie looks at the goals of Stonecoast she’s looking to accomplish through this program. Tee and Pip are a touch green with envy over Katie’s journey with Stonecoast. For someone who hates drop-in’s, Pip’s asking a lot from Tee in this episode. Does Stonecoast have business angles covered? It’s kind of important before you go into a blog tour to know what to do when you’re on a blog tour. Copy-Paste-Here’s-Your-Blogpost….no, that’s not what you do. There are bigger problems afoot if you don’t have evergreen blog content to offer a blog tour. So excited that we have Katie for a little more time! Katie is gathering a lot of dirt on it. And she’s a good intern ’cause she’s getting Tee coffee! Weather Child now has a cover. Tee & Pip head down to Richmond for The Writers’ Show! Dawn’s Early Light hits the shelves at the end of March! Something special coming up in February…. Oh yeah, RavenCon as well! Sweet as! Katie is coming to Balticon!!! And she’s talking about beer!! !